I am notoriously hard to shop. I admit it. I can be a pain in the derriere when it comes to presents, mostly because I despise clutter and if I don't LOVE something, I inevitably donate it or chuck it. I have scared my poor hubby and family into a tizzy at the mere mention of a birthday, Christmas, or whatever else warrants gift-giving. Rest assured, your gift giving panic can now be put asunder. Really. I will gladly accept ANYTHING and EVERYTHING from One Sydney Road. Seriously, there is not one thing I legitimately don't want from this splendid e-boutique. These little delights are on the top of my list, and the second I get my next pay check.....SHAZAM! 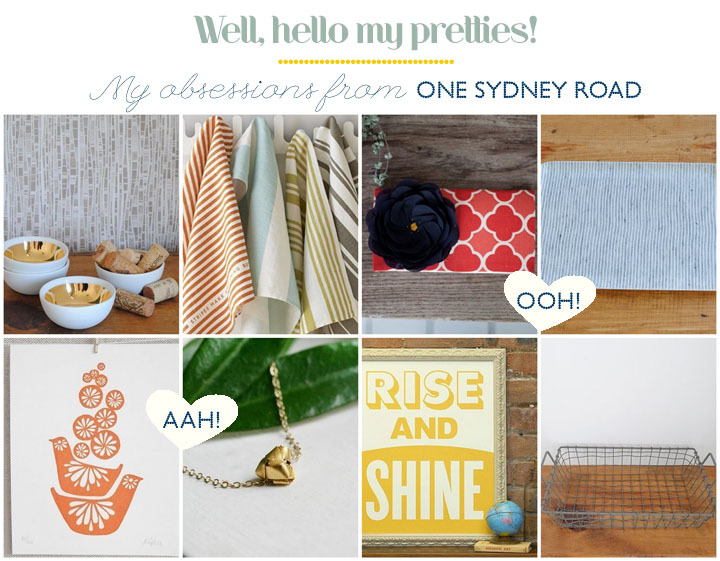 One Sydney Road will have it all. Le sigh. The wonderful Piper at One Sydney Road generously extended a special 20% discount code so you can add as many of these lovelies to your personal collections! Just use code GETOSR20 anytime before Valentine's Day. I just used it to buy the linen trays and gold bowls...and I am planning on going back for seconds when the origami necklace is back in stock and to pick up the Rise&Shine print and Emersonmade clutch! You just made my day! (and week, month... :) So glad you love the shop as much as I do (of course I'm a bit biased!!) Now your friends & family know where to shop for you - always good to know, right? Oh, and have a perfume GIVEAWAY right now if you'd like to enter!